Late last year, I published a post about five overlooked Japanese GameBoy games I thought all interested parties should play as soon as humanly possible. The titles highlighted in the write-up were Astro Rabby, Burning Paper, Noobow, Painter Momopie and Taiyou no Tenshi Marlowe: Ohanabatake wa Dai-Panic, in case anyone would like a refresher. At the time, I had no intention of following up that article. A couple of weeks ago, though, it struck me that I'd left more than a few sadly ignored GameBoy cartridges out of my original offering. Will I ever publish a third? I'm not planning to, but who knows. There's no question there are more Japanese GameBoy carts that deserve to have the spotlight turned their way, so if I can corral five of them I may just push forward with yet another "overlooked Japanese GameBoy games" post. Banishing Racer--I'm not so sure this game can be called "overlooked" at this point, especially among collectors. Still, I have a feeling your average Joe or Jane who only has a passing interest in Nintendo's first handheld system is completely unaware of Banishing Racer's existence, so I'd say it's as deserving of a mention here as any other Japanese GameBoy cartridge. 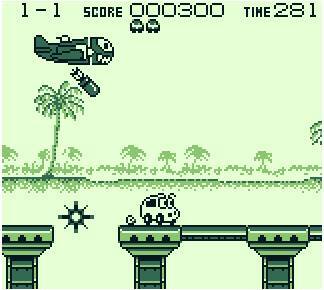 As for why I think those Janes and Joes should play this Jaleco-made offering, my main reason is it's a side-scrolling platformer that stars an adorable anthropomorphic car. Also, it sports a breezy soundtrack that's surprisingly easy on the ears. Unfortunately, Banishing Racer is short (just five worlds with three stages in each) and tends toward being cheaply difficult, but controlling a car with googly eyes--which may or may not be "related" to the vehicle at the heart of another great Jaleco game, City Connection--far outweighs both of those negatives in my humble opinion. Before you run off and try to hunt down a copy of Banishing Racer thanks to all the gushing I've done here, know that even loose carts can go for astronomical amounts these days. Cave Noire--Oh, Konami. Once upon a time, you produced some absolutely wonderful games--like this one, in fact. Not that you bothered to bring Cave Noire to Australia, Europe, North America or any other region outside of Japan. Of course, it's hard to blame the powers that be at Konami for giving the thumbs down to a localization of this portable roguelike. After all, the genre wasn't all that popular among console gamers in the early 1990s. (Cave Noire hit Japanese store shelves in 1991.) 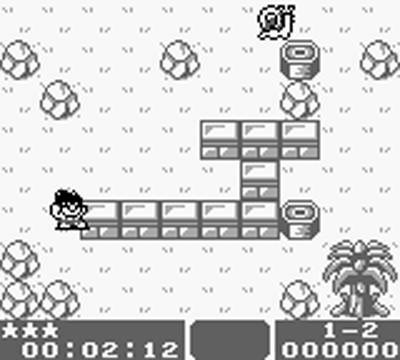 Thankfully, GameBoy systems were and continue to be region-free, so anyone who wants to put this curious title through its paces is free to do so. As for what they'll encounter after booting it up: that would be a dungeon-crawling RPG that takes some interesting liberties with the pattern laid down by genre-maker Rogue. You see, Cave Noire is divided into four distinct dungeons. Each of these claustrophobic chambers focuses on a different victory condition: one tasks you with collecting a certain amount of money, one demands you save a certain number of trapped fairies and so on and so forth. 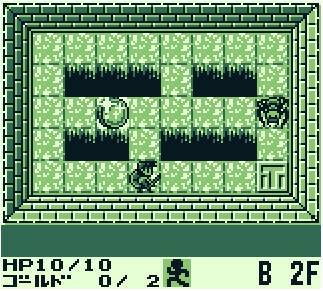 That combined with the bite-sized nature of the game's dungeons as well as its eye-pleasing visuals (which remind of Final Fantasy Adventure, aka Seiken Densetsu) and similarly adroit audio propels Cave Noire into must-play territory even if you don't know a lick of the language. Kitchen Panic--Full disclosure: this Coconuts Japan-published (in 1991) game is the least impressive of all the ones highlighted in this post. Thankfully, you also should be able to pick up a copy of Kitchen Panic for less money than you'd have to pay to buy any of the other titles mentioned here. As for why Kitchen Panic fails to thrill as much as, say, Cave Noire or Peetan, that would be because it's basically an arcade-y action game that doesn't provide a whole lot of depth. That's not to say it's not fun. 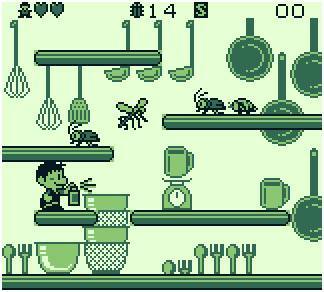 If you're in the mood for a nice little Mario Bros.-esque score-attack game that sports cute backdrops and sprites (mostly of various insects), Kitchen Panic is as good an option as any that were produced for the GameBoy during its long life. One last comment before I shut my trap and move on to the next overlooked Japanese GameBoy title: if you suffer from entomophobia you'll want to treat Kitchen Panic like the plague, as killing creepy-crawlies is the focus of this Bits Laboratory-made cartridge. 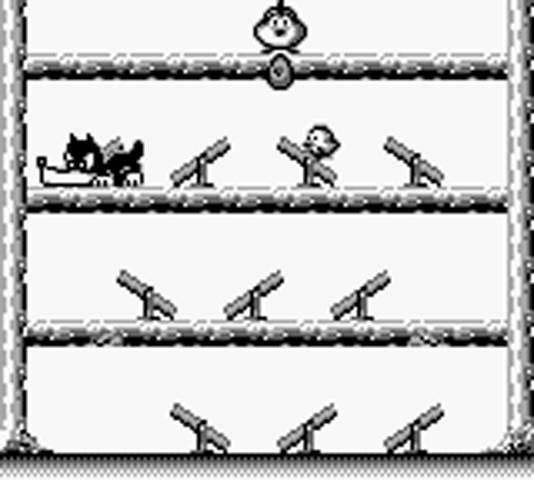 Nangoku Shounen Papuwa-kun: Ganmadan no Yabou--Enix didn't release many games that went under the radar in the West, but this is one of them. Admittedly, that's likely due to the fact that Nangoku Shounen Papuwa-kun never left Japan following its 1994 release there. Whatever the reason, the lack of worldwide interest in this Daft-developed title is disappointing, as it approaches the puzzle genre from a much different perspective than the multitude of competitors that clogged stores' GameBoy aisles back in the day. Here, the point is to position what look to be stone pillars (feel free to correct me if I'm wrong) so that a single punch from the titular Papuwa-kun will clear a stage of all its bricks. Unsurprisingly, succeeding at this is easy enough during the game's first few levels, but it becomes increasingly tough after that. Even then it remains enjoyable, so don't let my words of warning keep you from tracking it down and giving it a try. Peetan--Like Kitchen Panic, Peetan hardly overwhelms players with content. There's just one mode to choose from here, and it's a pretty straightforward affair. On a more positive note, the action-puzzler gameplay that serves as its backbone is both unique and invigorating. 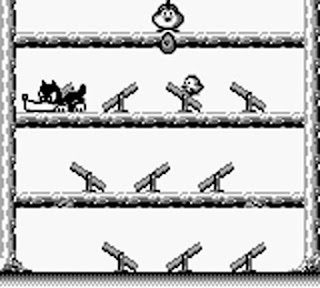 Your goal: help shepherd a group of baby chicks from the bottom of the GameBoy's screen to its top, where their distressed mother awaits. This is accomplished by waiting for one of the aforementioned chicks to start walking up one of the seesaws that populate each screen, positioning mama--whom you control--to one side or the other and then pressing the GameBoy's B button to drop an egg that will (hopefully) catapult the vulnerable offspring one level closer to its worrying parent. Making things all the more stressful is a wolf that prowls the stage in the hopes of gobbling up one or more of the feathered sprouts. Sounds appealing, right? Sadly, copies of Peetan are nearly as hard to come by as copies of Banishing Racer, and as a result can cost a pretty penny. Given that, my suggestion would be to look for a loose cart or simply download a ROM, if you're OK with such a thing.